In these difficult times, affording a quality higher education degree can be the determining factor on which institution is selected. At King's Seminary we have one simple goal: provide current and prospective students with the best possible assistance to facilitate their education goals at King's Seminary. Our students receive awards, scholarships, and grants from a wide variety of sources. Before applying for financial aid, students need to supply their financial obligations through personal funds saved for education and by building a personal support network. A personal support network may include the student's home church, denomination, people to whom the student has ministered, friends, family, clubs, and foundations. We also believe that no qualified student should be discouraged from pursuing seminary for merely financial reasons. We have established the King's Scholarship program to supplement student's own financial resources. King's Seminary is an official Religious Institution and regular member in good standing with the World Wide churches of Jesus Christ, In Touch Ministries and Universal Life Church Ministries throughout Canada and the United States. 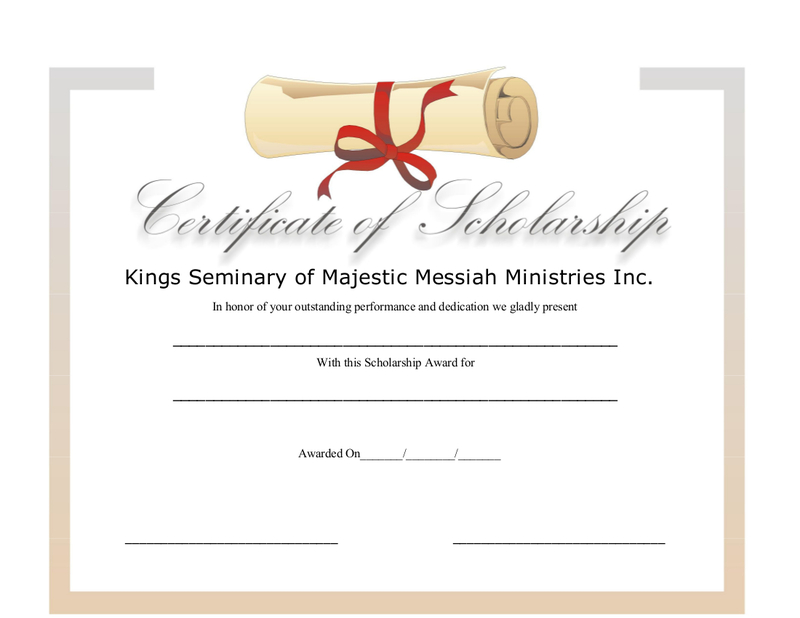 Below are scholarships offered and funded through King's Seminary of Majestic Messiah Ministries Incorporated. Please note the requirements for each offering; not all students are eligible to apply. King's Crown (Honor) Scholarship is funded by Majestic Messiah Ministries Inc. The Scholarship is for students with excellent capabilities for ministry and superior academic ability. All applicants must be entering into a Master or Doctoral class to pursue ministry as a life long commitment and career. Champions For Christ Scholarship exists for those who are Christ's servants called to follow Him, commissioned to share his word, dedicated to the gospel ministry, and leading others to Christ. Bethel Blessings Scholarship is for those students will become leaders, preachers and pastors in the Church of Christ. Stepping-Stone Scholarship exists to assist those who want to advance or continue their education in any field of choice in the Ministry. This also includes Youth Ministry and Evangelism. ****KING'S SPECIAL IS OUR DIPLOMA CLASSES FOR ANYONE WHO ENROLLS NOW YOU GET A $300.00 DISCOUNT****AND WRITE AN ESSAY AND TAKE ANOTHER $300.00 OFF. Yes, that's a total of five or six hundred dollars off the original price! Use KSCode: Dip16 for Diploma in Biblical Studies or KSCode:Dip17 for Diploma in Ministries (THIS OFFER IS ONLY GOOD AT KING'S SEMINARY AND FOR A LIMITED TIME) Don't be afraid or intimidated we want you to write that essay in the shower. Why? because we want you to get your feet wet! Chancellors Teaching Scholarship this scholarship fund provides financial aid to students preparing for a teaching career. All Sunday school Instructors and College Professors this scholarship is made especially for you. If you have any other questions regarding King's Scholarship program please see our FAQ page. Even though it's not in any specific order a lot of your questions should be answered. "Taking students to where the Lord needs them to be into the Heart of God"